“Magic Mushroom” redirects here. For other uses, see Magic Mushroom (disambiguation). Common, colloquial terms for psilocybin mushrooms include psychedelic mushrooms, magic mushrooms, shrooms, and mush. Biological genera containing psilocybin mushrooms include Copelandia, Gymnopilus, Inocybe, Mycena, Panaeolus, Pholiotina, Pluteus, and Psilocybe. Psilocybin mushrooms may have been used in ancient religious rites and ceremonies. They are depicted in Stone Age rock art in Europe and Africa, but most famously represented in the Pre-Columbian sculptures and glyphs seen throughout Central and South America. Prehistoric rock art near Villar del Humo, Spain, offers a hypothesis that Psilocybe hispanica was used in religious rituals 6,000 years ago, and that art at the Tassili caves in southern Algeria from 7,000 to 9,000 years ago may show the species Psilocybe mairei. 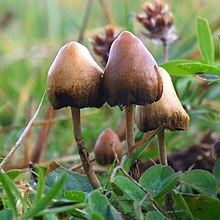 Hallucinogenic species of the Psilocybe genus have a history of use among the native peoples of Mesoamerica for religious communion, divination, and healing, from pre-Columbian times to the present day. Mushroom stones and motifs have been found in Guatemala. A statuette dating from ca. 200 CE. and depicting a mushroom strongly resembling Psilocybe mexicana was found in a west Mexican shaft and chamber tomb in the state of Colima. A Psilocybe species was known to the Aztecs as teōnanācatl (literally “divine mushroom” – agglutinative form of teōtl (god, sacred) and nanācatl (mushroom) in Náhuatl) and were reportedly served at the coronation of the Aztec ruler Moctezuma II in 1502. Aztecs and Mazatecs referred to psilocybin mushrooms as genius mushrooms, divinatory mushrooms, and wondrous mushrooms, when translated into English. Bernardino de Sahagún reported ritualistic use of teonanácatl by the Aztecs, when he traveled to Central America after the expedition of Hernán Cortés. In 1955, Valentina Pavlovna Wasson and R. Gordon Wasson became the first known European Americans to actively participate in an indigenous mushroom ceremony. The Wassons did much to publicize their discovery, even publishing an article on their experiences in Life in 1957. In 1956 Roger Heim identified the psychoactive mushroom that the Wassons had brought back from Mexico as Psilocybe, and in 1958, Albert Hofmann first identified psilocybin and psilocin as the active compounds in these mushrooms. At present, psilocybin mushroom use has been reported among some groups spanning from central Mexico to Oaxaca, including groups of Nahua, Mixtecs, Mixe, Mazatecs, Zapotecs, and others. An important figure of mushroom usage in Mexico was María Sabina, who used native mushrooms, such as Psilocybe mexicana in her practice. Non-Psilocybe species of psilocybin mushroom include Pluteus salicinus (left), Gymnopilus luteoviridis (center), and Panaeolus cinctulus, formerly called Panaeolus subbalteatus (right). Present in varying concentrations in about 200 species of Basidiomycota mushrooms, psilocybin evolved from its ancestor, muscarine, some 10 to 20 million years ago. 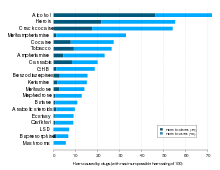 In a 2000 review on the worldwide distribution of psilocybin mushrooms, Gastón Guzmán and colleagues considered these distributed among the following genera: Psilocybe (116 species), Gymnopilus (14), Panaeolus (13), Copelandia (12), Hypholoma (6), Pluteus (6) Inocybe (6), Conocybe (4), Panaeolina (4), Gerronema (2), Agrocybe (1), Galerina (1) and Mycena (1). Guzmán increased his estimate of the number of psilocybin-containing Psilocybe to 144 species in a 2005 review. Many of these are found in Mexico (53 species), with the remainder distributed in Canada and the US (22), Europe (16), Asia (15), Africa (4), and Australia and associated islands (19). In general, psilocybin-containing species are dark-spored, gilled mushrooms that grow in meadows and woods of the subtropics and tropics, usually in soils rich in humus and plant debris. Psilocybin mushrooms occur on all continents, but the majority of species are found in subtropical humid forests. Psilocybe species commonly found in the tropics include P. cubensis and P. subcubensis. P. semilanceata, considered the world’s most widely distributed psilocybin mushroom, is found in Europe, North America, Asia, South America, Australia and New Zealand, although it is absent from Mexico. As with many psychedelic substances, the effects of psychedelic mushrooms are subjective and can vary considerably among individual users. The mind-altering effects of psilocybin-containing mushrooms typically last from three to eight hours depending on dosage, preparation method, and personal metabolism. The first 3–4 hours of the trip are typically referred to as the ‘peak’—in which the user experiences more vivid visuals, and distortions in reality. However, the effects can seem to last much longer to the user because of psilocybin’s ability to alter time perception. Noticeable changes to the auditory, visual, and tactile senses may become apparent around 30 minutes to an hour after ingestion, although effects may take up to two hours to take place. These shifts in perception visually include enhancement and contrasting of colors, strange light phenomena (such as auras or “halos” around light sources), increased visual acuity, surfaces that seem to ripple, shimmer, or breathe; complex open and closed eye visuals of form constants or images, objects that warp, morph, or change solid colours; a sense of melting into the environment, and trails behind moving objects. Sounds may seem to have increased clarity—music, for example, can often take on a profound sense of cadence and depth. Some users experience synesthesia, wherein they perceive, for example, a visualization of color upon hearing a particular sound. As with other psychedelics such as LSD, the experience, or “trip”, is strongly dependent upon set and setting. A negative environment could contribute to a bad trip, whereas a comfortable and familiar environment would set the stage for a pleasant experience. Psychedelics make experiences more intense, so if a person enters a trip in an anxious state of mind, they will likely experience heightened anxiety on their trip. Many users find it preferable to ingest the mushrooms with friends, people with whom they are familiar, or people who are familiar with ‘tripping’. The psychological consequences of psilocybin use include hallucinations and an inability to discern fantasy from reality. Panic reactions and psychosis also may occur, particularly if a user ingests a large dose. In addition to the risks associated with ingestion of psilocybin, individuals who seek to use psilocybin mushrooms also risk poisoning if one of the many varieties of poisonous mushrooms is confused with a psilocybin mushroom. Dosage of mushrooms containing psilocybin depends on the potency of the mushroom (the total psilocybin and psilocin content of the mushrooms), which varies significantly both between species and within the same species, but is typically around 0.5–2.0% of the dried weight of the mushroom. A typical low dose of the common species Psilocybe cubensis is about 1.0 to 2.5 g, while about 2.5 to 5.0 g dried mushroom material is considered a strong dose. Above 5 g is often considered a heavy dose with 5.0 grams of dried mushroom often being referred to as a “heroic dose”. The UK ban on fresh mushrooms introduced in 2005 came under much criticism, but was rushed through at the end of the 2001-2005 Parliament; until then, magic mushrooms had been sold in the UK. New Mexico appeals court ruled on June 14, 2005, that growing psilocybin mushrooms for personal consumption could not be considered “manufacturing a controlled substance” under state law. However, it still remains illegal under federal law. ^ Canada, Health (2012-01-12). “Magic mushrooms – Canada.ca”. www.canada.ca. Retrieved 2017-12-20. ^ a b c Guzmán G. (2008). “Hallucinogenic mushrooms in Mexico: An overview”. Economic Botany. 62 (3): 404–412. doi:10.1007/s12231-008-9033-8. ^ Akers, Brian P.; Ruiz, Juan Francisco; Piper, Alan; Ruck, Carl A. P. (2011-02-17). “A Prehistoric Mural in Spain Depicting Neurotropic Psilocybe Mushrooms?1”. Economic Botany. 65 (2): 121–128. doi:10.1007/s12231-011-9152-5. ISSN 0013-0001. ^ Rush, John A. (2013). Entheogens and the Development of Culture: The Anthropology and Neurobiology of Ecstatic Experience. North Atlantic Books. p. 488. ISBN 978-1-58394-624-4. ^ Samorini, G. (1992). “The oldest representations of hallucinogenic mushrooms in the world (Sahara Desert, 9000–7000 B.P.)”. Integration. 2 (3): 69–78. ^ Hofmann A. (1980). “The Mexican relatives of LSD”. LSD: My Problem Child. New York, New York: McGraw-Hill. pp. 49–71. ISBN 978-0-07-029325-0. ^ Brande E. (1799). “Mr. E. Brande, on a poisonous species of Agaric”. The Medical and Physical Journal: Containing the Earliest Information on Subjects of Medicine, Surgery, Pharmacy, Chemistry and Natural History. 3: 41–44. ^ Heim R. (1957). “Notes préliminaires sur les agarics hallucinogènes du Mexique” [Preliminary notes on the hallucination-producing agarics of Mexico]. Revue de Mycologie (in French). 22 (1): 58–79. ^ Hofmann A, Frey A, Ott H, Petrzilka T, Troxler F (1958). “Konstitutionsaufklärung und Synthese von Psilocybin” [The composition and synthesis of psilocybin]. Cellular and Molecular Life Sciences (in German). 14 (11): 397–399. doi:10.1007/BF02160424. ^ Hofmann A, Heim R, Brack A, Kobel H (1958). “Psilocybin, ein psychotroper Wirkstoff aus dem mexikanischen Rauschpilz Psilocybe mexicana Heim” [Psilocybin, a psychotropic drug from the Mexican magic mushroom Psilocybe mexicana Heim]. Experientia (in German). 14 (3): 107–109. doi:10.1007/BF02159243. PMID 13537892. ^ Monaghan, John D.; Cohen, Jeffrey H. (2000). “Thirty years of Oaxacan ethnography”. In Monaghan, John; Edmonson, Barbara (eds.). Ethnology. Austin, Texas: University of Texas Press. p. 165. ISBN 978-0-292-70881-5. ^ Kosentka, P; Sprague, S. L; Ryberg, M; Gartz, J; May, A. L; Campagna, S. R; Matheny, P. B (2013). “Evolution of the Toxins Muscarine and Psilocybin in a Family of Mushroom-Forming Fungi”. PLoS ONE. 8 (5): e64646. Bibcode:2013PLoSO…864646K. doi:10.1371/journal.pone.0064646. PMC 3662758. PMID 23717644. ^ a b Guzmán, G.; Allen, J.W. ; Gartz, J. (2000). “A worldwide geographical distribution of the neurotropic fungi, an analysis and discussion” (PDF). Annali del Museo Civico di Rovereto: Sezione Archeologia, Storia, Scienze Naturali. 14: 189–280. ^ Guzmán G, Allen JW, Gartz J (1998). “A worldwide geographical distribution of the neurotropic fungi, an analysis and discussion” (PDF). Annali del Museo Civico di Rovereto. 14: 207. ^ a b Guzmán, G. (2005). “Species diversity of the genus Psilocybe (Basidiomycotina, Agaricales, Strophariaceae) in the world mycobiota, with special attention to hallucinogenic properties”. International Journal of Medicinal Mushrooms. 7 (1–2): 305–331. doi:10.1615/IntJMedMushr.v7.i12. ^ Passie, T.; Seifert, J.; Schneider, U.; Emrich, H.M. (2002). “The pharmacology of psilocybin”. Addiction Biology. 7 (4): 357–364. doi:10.1080/1355621021000005937. PMID 14578010. ^ “Psilocybin Fast Facts”. National Drug Intelligence Center. Retrieved 2007-04-04. ^ a b van Amsterdam, J.; Opperhuizen, A.; van den Brink, W. (2011). “Harm potential of magic mushroom use: A review”. Regulatory Toxicology and Pharmacology. 59 (3): 423–429. doi:10.1016/j.yrtph.2011.01.006. PMID 21256914. ^ Wittmann, M.; Carter, O.; Hasler, F.; Cahn, B.R. ; Grimberg, U.; Spring, P.; Hell, D.; Flohr, H.; Vollenweider, F.X. (2007). “Effects of psilocybin on time perception and temporal control of behaviour in humans”. Journal of Psychopharmacology. 21 (1): 50–64. doi:10.1177/0269881106065859. PMID 16714323. ^ Espiard, M.L. ; Lecardeur, L.; Abadie, P.; Halbecq, I.; Dollfus, S. (2005). “Hallucinogen persisting perception disorder after psilocybin consumption: A case study”. European Psychiatry. 20 (5–6): 458–460. doi:10.1016/j.eurpsy.2005.04.008. PMID 15963699. ^ “Psilocybin Fast Facts”. National Drug Intelligence Center, US Department of Justice. Retrieved 3 May 2018. This article incorporates text from this source, which is in the public domain. ^ a b Erowid (2006). “Dosage Chart for Psychedelic Mushrooms” (shtml). Erowid. Retrieved 2006-12-01. ^ “Terence McKenna’s Last Trip”. Wired Magazine. Condé Nast Publications. 1 May 2000. Retrieved 17 September 2017. ^ Jesso, James W. (13 June 2013). Decomposing The Shadow: Lessons From The Psilocybin Mushroom. SoulsLantern Publishing. p. 90. ISBN 978-0991943500. Retrieved 17 September 2017. ^ Griffiths, Roland R.; et al. (October 2017). “Psilocybin-occasioned mystical-type experience in combination with meditation and other spiritual practices produces enduring positive changes in psychological functioning and in trait measures of prosocial attitudes and behaviors”. Journal of Psychopharmacology. 32 (1): 49–69. doi:10.1177/0269881117731279. PMC 5772431. PMID 29020861. ^ “Psilocybin (from magic mushrooms) plus meditation and spiritual training leads to lasting changes in positive traits”. Research Digest. 2018-01-19. Retrieved 2019-02-21. ^ Gartz J, Allen JW, Merlin MD (2004). “Ethnomycology, biochemistry, and cultivation of Psilocybe samuiensis Guzmán, Bandala and Allen, a new psychoactive fungus from Koh Samui, Thailand”. Journal of Ethnopharmacology. 43 (2): 73–80. doi:10.1016/0378-8741(94)90006-X. PMID 7967658. ^ “List of psychotropic substances under international control” (PDF). International Narcotics Control Board. August 2003. Archived from the original (PDF) on 2005-12-05. Retrieved 2007-06-25. ^ “RTÉ News: ‘Shrooms to become illegal in Holland”. RTÉ News. November 2008. Retrieved 2008-11-28. ^ “Erowid Psilocybin Mushroom Vault : Legal Status”. www.erowid.org. Retrieved 2010-01-03. ^ The Oregonian. “Psychedelic mushroom legalization effort in Oregon gets ballot language approval”. Oregon Live. The Oregonian. Retrieved December 4, 2018. ^ “Kodai’s ‘magic shrooms’ give you a high – Times of India”. The Times of India. Retrieved 2017-02-20. Ballesteros, S.; Ramón, M.F. ; Iturralde, M.J.; Martínez-Arrieta, R. (2006). “Natural Sources of Drugs of Abuse: Magic Mushrooms”. In Cole, S.M. (ed.). New Research on Street Drugs. Nova Science Publishers. ISBN 978-1594549618. Wurst, M.; Kysilka, R.; Flieger, M. (2002). “Psychoactive tryptamines from Basidiomycetes”. Folia Microbiologica. 47 (1): 3–27. doi:10.1007/BF02818560. PMID 11980266.